I love how the photo provides another space for interpretation of the piece. 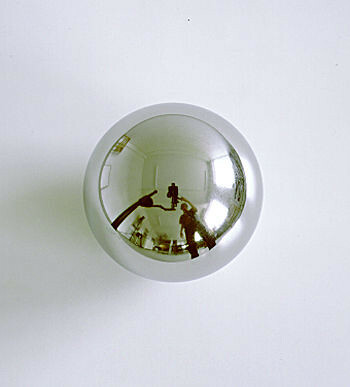 The photograph provides a separation distance between you and the orb – more precisely, the presence of an image in your likeness which can only occur obviously given the situation “in real time” between you and the orb… You see your likeness in the mirror… Here through the photograph – the separation distance is quite apparent as it offers a glimpse of the relationship to the moment when a photograph was taken…. Untitled 2008, Matthew Jordan – From his series “half empty“… more here…. This entry was posted in Art Photography, Constructed Illusions, Inspiration, Other Artists, Photography and tagged Gerhard Richter, Matthew Jordan by Matt Niebuhr - West Branch Studio. Bookmark the permalink.